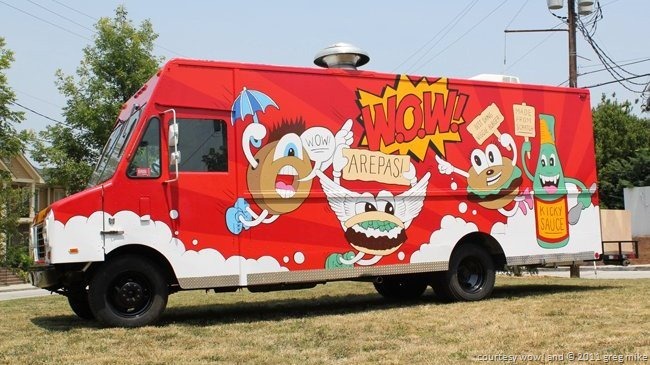 The tale of the WOW Food Truck is a long and sordid tale of murder, intrigue, betrayal, and arepas. Okay, not so much on the first three, but yes on those Venezuelan corn-cakes. 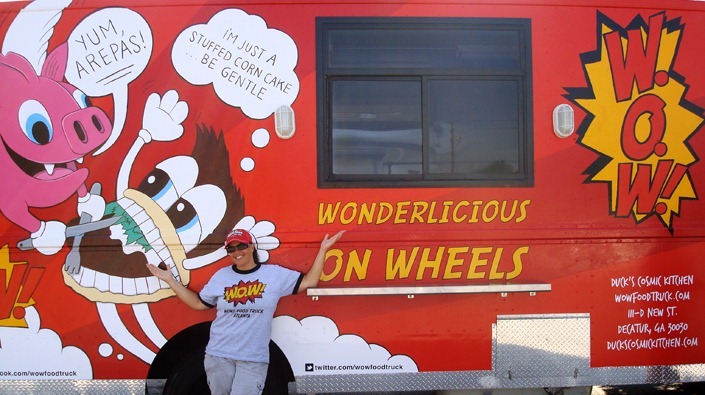 Wonderlicious on Wheels, aka WOW in its short form, is a brand new food truck from Wendy Cross and her partners at Duck’s Cosmic Kitchen. Launched just this week, we at RoamingHunger.com made sure to get all the meaty details. WOW’s inception dates back to New York City in 2008/2009. At the time, street food wasn’t even a word in Atlanta’s lexicon and the explosion was in its infancy in other cities. Cross was visiting her brother in New York and looking for a something different for dinner. Her brother David, yes … THAT David, suggested that Wendy and her partner check out an arepa joint. Having exactly no idea what an arepa was, it took Cross some time to realize that her brother wasn’t pulling a fast one on her. No, the comedic ruffian was in fact suggesting that Wendy try out one of those corn-cake sandwiches popular in Venezuela, Colombia, and much of Latin America. After just one bite, Cross made a promise to herself: “I have got to bring these to Atlanta.” Roughly two-years later, she has made good on that promise. Since her flirtation in New York, Cross has spent a great deal of time perfecting the recipe for both the corn cakes and the varietals of slow-roasted meat found within. It’s a process we at RH have observed for the better part of the last 18-months and know just how far they’ve come. 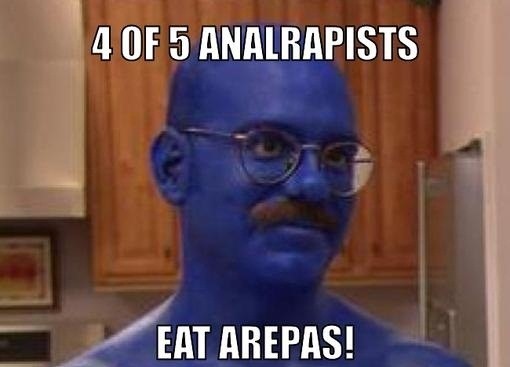 As arepas are a relatively unknown commodity around these parts, Cross was happy to let us know that “eating arepas makes you richer, younger, and thinner. It’s true!” When pressed to confirm whether that was actually the case during swimsuit season, Cross simply refused to answer. To help get the project from concept to production, Cross has both brought in and employed a series of capable people. Cross has partnered with Cindy Diamond and Ann Duckworth to form the ownership group of both Duck’s and WOW. With Diamond and Cross manning the truck, Duckworth serves as WOW’s executive chef. Though Cross still handles the arepas, Duckworth has helped to bring a handful of other offerings to this mobile eatery (more on that in a bit). Ah, but an aspiring food truck also needs some strong branding. After kicking around a few other names and brand concepts, Cross and her partners ultimately settled on Wonderlicious on Wheels. To help bring the WOW concept to life, the gang hired Greg Mike, a local Atlanta artist and owner of ABV Creative Agency. As a result, a handful of pop art styled comic book characters adorn the 20 foot long truck. Mike has posted a bunch of pictures of WOW over on the ABV site. But back to the food and drink … which save for the cheese and a few of the beverages … is all handcrafted. The main attraction at WOW is unequivocally their griddled-to-order arepas. At the very street friendly price of $3.50/per you can get beef, chicken, pork, or vegetable. The latter offer is a mixture of cheese+tomato+basil, but all of them, which can be had with WOW’s special jalapeño-cilantro Kicky Sauce, are chef driven examples. Cross says there are plans to add some special samplings in the near future. To round out the menu, Duckworth has added a pot roast sandwich and a chicken salad sandwich (both $4), a veggie burger, a tomato pie ($3.50), some crispy shrimp cakes ($3.50), and sides of roasted potatoes (with smoked poblano sauce) as well as shaved apple slaw (both $2). The pies come room truck temperature and include tomato, goat cheese, and basil. Goat cheese also appears on the veggie burger in the form of a red pepper goat cheese spread. As mentioned, everything from the bread to the fillings, save for the cheese, is made by hand at Duck’s. For those with a sweeter tooth, there is lavender lemonade and those baked cake doughnuts from Duck’s. Those doughnuts are the very same as the ones on CL’s 100 Atlanta dishes to eat before you die. Beyond that, much of what is to come is TBD. However, if you’re looking to check out WOW sooner than later, they’ll be setup at Tuesday night’s Howell Mill Food Park event. You’ll also be able to keep up with all things WOW on their Roaming Hunger profile page.